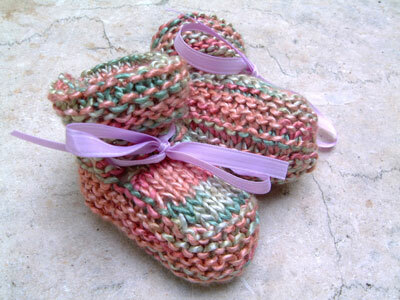 Baby Booties and baby booty gift sets- Handknit, handmade luxury shower gifts! 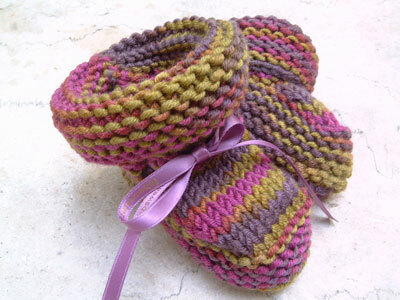 Our handknits make Great Gifts. Ordering our customized card and wrap is easy! just click 'Make it a Gift' at checkout! You can use this with anything at FAB! Contact Fab | join The Fab Updates List fab is closed for the season! Come visit again next year! New: Matching Adult & Kids Sweaters! 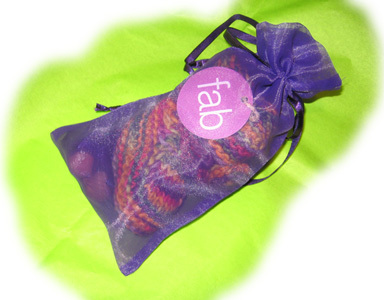 Our gorgeous gift bag comes stuffed with our handknit booties: plus a cedar sachet - all wrapped in fabulous organza, and topped off with a custom note. Gift wrap is available too, in three great colors. A terrific baby gift. How to find the perfect gift for the perfect baby? There's only one way. Think Unique. Think Unusual. Think of something that can be handed down. Go look at what everyone else is selling for baby shower gifts. And then come here. 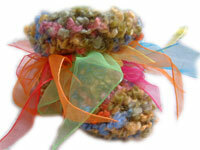 You'll find a baby gift that is beyond compare. Contact us, tell us about the mom, and the dad, and we'll point you to the right sweater for that special baby.